Sikkim, this state is located in Himalaya and its is bordered by Nepal in west,Bhutan in east and West Bengal in South.As per wiki,Sikkimese cuisine is one of the popular cuisines coming from North-East India. Sikkimese are traditionally rice eaters. Sikkim is the only state in India with an ethnic Nepali majority and for this reason, Nepalese cuisine is very popular in Sikkim.The staple food of the people of Sikkim is rice though they take maize as well. They have their own cuisine culture. Sikkhim food is said to be very delicious and it suits to their clime as well.Sikkhim cuisine is influenced by Chinese cuisine and the other North Indian states cuisines.Sikkhim people prepare different type of fern-based foods and they use fermented bamboo in their cooking too. The tomato achar of Sikkhim is well-known. They also take Momos and noodles in abundance. Apart from momos, the other dishes from this Sikkimese cuisine is completely unknown for me and while searching a different dish other than momos for this state, i got this Tama curry here.Do you know this Tama is a non-fermented bamboo shoots. Some varieties of bamboo shoots commonly grown in the Sikkim Himalayas are Dendrocalamus hamiltonii, Dendrocalamus sikkimensis and Bambusa tulda locally known as ‘choya bans’, ‘bhalu bans’ and ‘karati bans’, respectively are edible when young. These bamboo shoots are collected, defoliated and boiled in water with turmeric powder for 10-15 min to remove bitter taste of bamboo. Tama is ready for consumption. Tama is commonly sold in the local markets during the months of June to September when young bamboo shoots sprout.For making this bamboo shoot curry with canned bamboo shoots i picked from Chinese store. Heat oil, fry the methi seeds. Add the bamboo shoots, turmeric powder, sliced chilly, salt,cook everything for few minutes. Bamboo shoot curry is ready to eat. This is very new to me Priya. I have never cooked bamboo. Now I know why this is available in market. Curry looks very delicious and quick. That's quite simple and nice..NE food is so simple most times right.. I hv tried Bamboo shoots in Chinese dishes.. first time seeing in Indian dish.. yum! Thanks for bringing to us all these wonderful recipes Priya! Lovely bamboo shoot dish! I have never tried it in curry before. Different and deserves a try. thanks Priya! how are you by the way? that is so simple and elegant Priya!! looks like potato to me.. love it..
Never had bamboo shoots, looks interesting and delicious..
Never used Bamboo shoots in cooking...sounds very interesting!! thats one easy curry or stir fry one can have. looking very tempting priya!! I loved the chopping style!! Such a simple dish! Looks tempting! I have tasted bamboo shoots as one of the ingredients but never the main ingredient. Simple but very different recipe. Nice one. 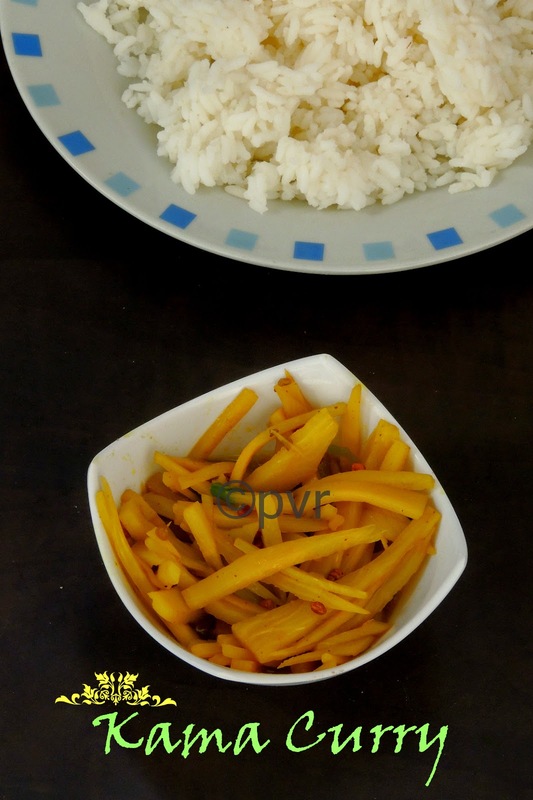 I have never eaten bamboo shoots and was skeptical to try it out. Looks good though! I've never tasted bamboo shoots and will have to look for them in the Asian store. Curry is simple and easy to make. Never tasted bamboo shoots,this curry sounds inviting.. I liked the fact that most of the vegetables from this state are cooked with very minimal spices yet taste awesome. Banboo shoots curry looks yummy. Lucky you priya, you got bamboo shoots, i tried my level best for the canned ones, couldn't find any near my place!!! Curry looks simple, but definitely exotic!!! wow aks you are so gutsy to try your hand on bamboo shoot I still am not so confident if i wud like bamboo shoots but wud love to give it a try .. so glad you found a very diffrent dish for this state , mild and interesting curry aks !! Wow thats all??? It looks so very yum and its simple.Love it Priya! I have never eaten bamboo shoots and so I cannot comment regarding the flavor department. Howver the dish looks simple and good.